Indianapolis Motor Speedway gets Wired! I’d have to say that I am personally a wee bit disappointed with this list. Don’t get me wrong…Bonneville is cool, but as the top ten of all race tracks this list isn’t it. the tarmac? Daytona? 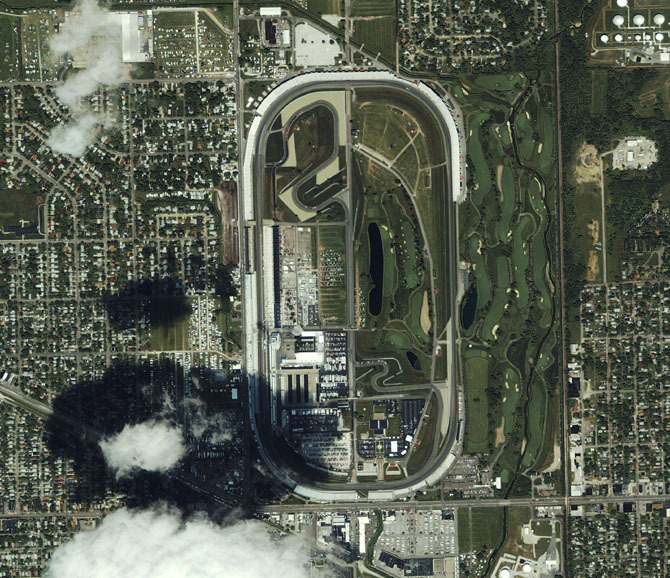 I guess the track looks cool from the sky with lake inside the track but how about Disney Superspeedway with Mickey’s head carved in the infield! And lastly Eldora. I know its owned by Smoke, but its not pretty to look at from the sky and I wouldn’t say that its pretty in person. Here are a few of the other tracks that I though would have been nice to look at from space. Circuit de Paul Ricard: I’d say that this track is probably the most photogenic track anywhere. The blue and orange lines that outline the track are a photographers dream! Check it from the sky. Monza: With its super oval in ruins, Monza is a modern facility with the Colosseum of motor racing surrounding the current Formula 1 circuit. What I really like about Monza is that its strikingly similar to the Indianapolis Motor Speedway. Both are located in the middle of the city, both are surrounded by striking oval circuits and both have golf courses surrounding them…. Abu Dahbi: It may not be impressive from through google maps, but I can certainly image that its extremely impressive from space at night. Laguna Seca: Carved out of the mountainous coast line of norther California, Laguna Seca is majestic from above, especially when low laying clouds hover between th many levels of the track. Take a look at the picture to the right. AVUS was nearly 18 MILES in length and had two ends. Turns 1-5 were shaped like the Carousel at Road American and the other end was like Talledega! There are plenty of other tracks that deserve to be mentioned, but these were the first to pop into my keyboard…..What are your thoughts?